If we can’t see your address …We can’t find you. Seconds count when you have a fire or medical emergency. Accidents and fires happen. When these emergencies occur, precious seconds that are lost trying to find an address can mean the difference between life and death. The Addison Fire Protection District has initiated a rural address sign program. Members of the Addison Fire Protection District will be providing and installing for FREE these much needed, highly visible address signs near the end of your driveway. These easy-to-read signs have 4″ white reflective numbers on an 8″ x 16″ red aluminum plate, affixed to a green steel post. While the signs help the fire district find you, they also help other public safety agencies such as police, animal control and ambulance. The signs are also of tremendous benefit to delivery companies such as UPS or FEDEX and utility services such as gas, phone, power, and cable. They will also aid visitors to locate rural residents much faster and easier. 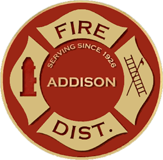 This program is for residents that live within the Addison Fire Protection District only and is not available for those that reside within another fire agency’s district. Installations occur after permission slips are received and please allow 6-10 weeks for installation after all necessary paperwork is completed. If you live in a rural area served by the Addison Fire Protection District and are interested in participating in this program, please call (630) 628-3100 during normal business hours to obtain the proper paperwork and to schedule the installation of your rural address sign.